Prior to Vatican II, this sacrament was referred to as the Last Rites or Extreme Unction. Since Vatican II, the faithful are encouraged to receive the sacrament any time they are sick or anticipating a medical procedure. It is a Sacrament of Healing. It is not reserved just for those who are dying. 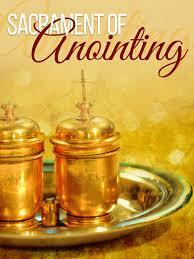 The Sacrament of Anointing is available by contacting one of the priests at the Parish Office – 636-8159.